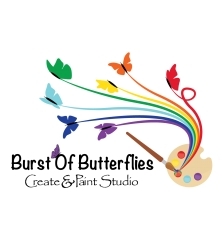 Tempe, AZ, January 15, 2019 --(PR.com)-- After 4 years of being part of creative memories for their guests, Burst Of Butterflies Create & Paint Studio has made a name for itself in the community, and patrons love the diversity of choices for getting creative. With a choice of Walk-in Activities, Classes, Birthday Parties, Scout Activities, Team-building events and more, Burst Of Butterflies is an anytime destination founded by a family who are not only skilled at a variety of art types, but who also believe strongly in the power of art to escape the outside world and spend quality time with friends and family flexing their creative muscle. With its flagship location in historic downtown Chandler, Burst Of Butterflies is a family-owned and operated studio by three generations: family matriarch Peggy Peters, sisters Cheryl Tisland and Theresa Buglio, and Cheryl’s son Lucas Tisland. The motivation to open a studio came after Theresa was involved in an accident that resulted in a traumatic brain injury and 14 weeks in the hospital leaving her permanently disabled. We had to scramble to rearrange our lives to care for her and found that our traditional day jobs were making this difficult. Realizing that being away from home for long hours at their traditional careers would no longer be suitable for Theresa, the family began to brainstorm. Theresa is permanently disabled, but we wanted to give her the ability to feel whole again, so we decided it would be cool to all start a business so that we could be together doing something we love, and caring for her at the same time, as well as giving her the ability to have a sense of having her own job and her own money. With Peggy and Cheryl switching from careers in optometry and software engineering, respectively, they briefly toyed with a few business ventures before settling on the ceramics and creative industry. Other ideas for their family business included a vintage clothing shop, but Cheryl says they ultimately realized that with Peggy’s long-time hobby of canvas painting, Cheryl’s love of industrial art, and Lucas’ background in ceramics, opening an art studio was the perfect fit for their family. In just a little more than a year of planning, Burst Of Butterflies opened in January 2015 at their flagship location in Historic Downtown Chandler and is now run by the four of them with the help of a few employees. The studio offers pottery painting, canvas painting, wet clay, and glass fusing. There are classes weekly for kids and adults in clay wheel throwing and sculpting, glass fusing pendants, and instructional canvas painting. In addition, the large walk-in open-studio area seats 45 people and is available with no appointment needed for groups of 1 to 5 people. There is a large party room that leads out to a beautiful patio and is available for birthday parties, meetup groups, church groups, corporate team-building, scout events, and more. It is a great place to walk in and relax with something creative while socializing with friends and family. We love seeing all of the creativity that happens in the studio and all of the smiles and laughter. It is a happy place and everyone is family to us. Burst Of Butterflies is a place to create memories that last a lifetime...creative fun for everyone.